Our volunteers- we hope soon to include you on this site. Below is our gallery of our volunteer stars. People from various professions and with different interests join us in common efforts to serve those who are determined to create a viable community and live out meaningful lives. We build schools, orphanages, create agricultural programs and work with others who have the same vision as we do. If you would like more information on any of our projects, please contact us. We also ask for your support to enable us to continue our work. Please check the various ways you can work with us by visiting our Participate page. Yolanda and Joey with some of our Karen orphans. We are building a boys dorm as the boys and girls are now in need of separate quarters. 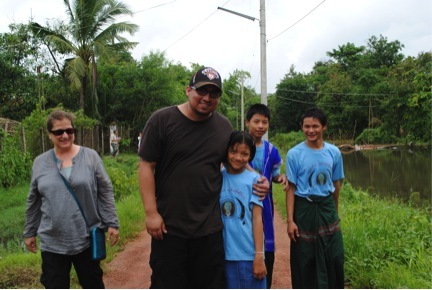 Below are volunteers with the Karen boys, and a picture of a typical way to cool the face in the hot summer weather. 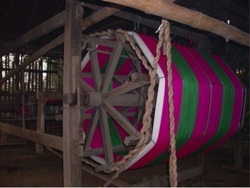 The third picture is an example of a Karen weaving on a large loom. Lanna Kingdom Projects took several group to this school to provide clothing, treats for the children, and several new computers to place in the air-conditioned room they built just for the computers. 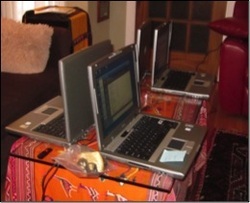 On a computer, deaf children have access to the world. Below are pictures of children in their classrooms that include learning a regular school curriculum as well as trades such as sewing. Luis attending to the computers (a total of 17) taken (April 2013) to those who could never afford one of their own. He updates them with a virus protection and other programs- in other words when he is done with them, they are in great shape. All are wireless, as well. In the picture below, Luis is with the single woman left who speaks a dialogue not written or understood by more than a handful of people. She is not sure of her age or her origin, But she well remembers her days as a slave. We helped her with finances for her daily living. On the far left, one of the local entrepreneurs who finds enough pennies to give to those who have less than she. 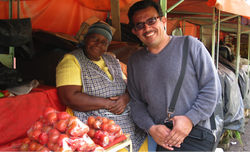 This woman was part of a project that Luis worked on in Ecuador. If you would like to make a tax deductible contribution (EIN: 27-2017646), please click on the "Donate" link below. Thank you!